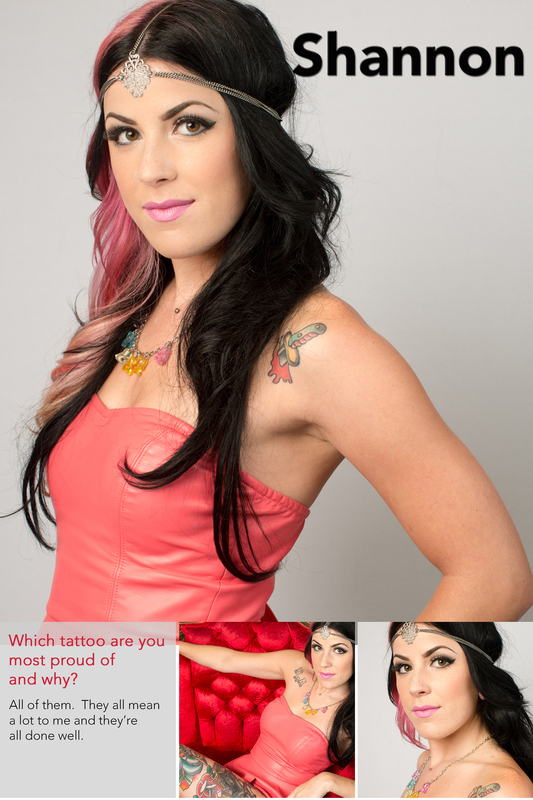 Then 2) feature each girl have them talk about the tattoo they are most proud of. I had other questions but had to narrow it down to one so the font would be large enough to read. Last, we have a group shot on a most excellent red couch we used throughout the session. Big thanks to Kate for setting most everything up, to Frank for allowing us to use his shop on his day off, to Ross for helping with lights and adding music to the shoot, and to Nicole, Shannon, Kait, and Heather for modeling. One other girl that was mostly behind the scenes was Rachel that helped with make-up for the girls and some modeling on the first set-up. Great teamwork!